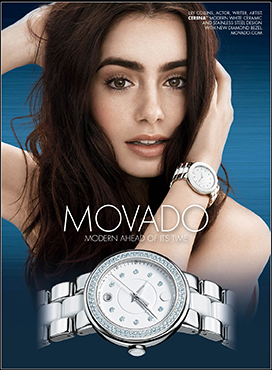 As I looked through my Bazar magazine I came across Lily Collins ad for the Movado Cerena and I fell in love again. I have always loved Movado, I love how simple, sophisticated, and chic their watches are. I also love how they never did the huge oversize face, which I was never a fan of. So glad that fad is dying down. I've had my eye on a Movado since I was 16, I remember going with my parents and my dad wanted to get a new Movado, my parents love Movado as well. I saw this gorgeous watch that they sadly don't make anymore. The band was these white circles that had a pearl luster effect and the face actually looked a lot like the Cerna, with the diamonds around it. It was stunning and I'm really sad I was never able to get my hands on it. I remember showing my parents and my dad was actually thinking about getting it for me till we found out the price tag was $3,500!!! So my parents obviously didn't get it for me and I totally understood, lol. I think I'll get myself a Movado once I make a huge accomplishment like graduating college, landing my first real job (we'll see about that). But today I thought I'd share some of the Movado wish list. Given the entire Movado website is on my wishlist cause a Movado will never go out of style. In my opinion Movado is the Chanel of watches, classic and always in style. 4 comments on "The Allure of a Movado"
Who wouldn't fall in love with a Movado with that ad! Gorgeous! She's just gorgeous, she can sell me anything lol. Thanks for stopping by! I would LOVE a Movado watch for Christmas!! Love all of the ones you posted! That would be one of the most amazing christmas gifts. Thanks for stopping by!